The first World Cup was in 1930 and if you are looking for memorabilia from then or even the subsequent World Cups up to 1966 you will find posters, autographs and programmes, but not much else. We can blame 1966 and World Cup Willie for the era of collectable memorabilia. Pictured right: World Cup Willie memorabilia – An official cloth doll, a snow storm in original box, an ashtray, a pen-knife, a horse brass, a hanging car mascot, a commemorative pin in original box, four metal badges, six plastic badges and three key rings all featuring World Cup Willie. Sold for £180 at Bonhams, London, June 2006. World Cup Willie was the first official mascot for the FIFA World Cup, being used to represent the 1966 FIFA World Cup in the United Kingdom. He was a large anthropomorphic lion who wore a Union Flag jersey with the words “WORLD CUP”. 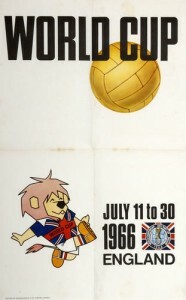 Willie was the creation of artist Reg Hoye, who was asked to design a mascot for the World Cup competition by the English Football Association. 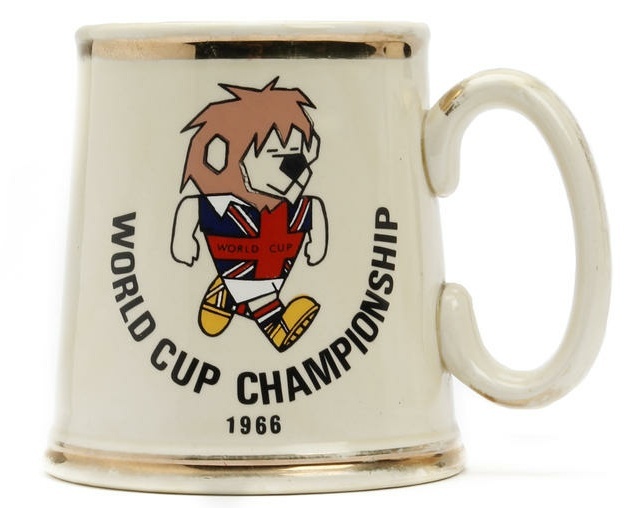 Pictured left: A 1966 World Cup Willie tankard – 1966 flag logo to side and World Cup Willie mascot, gold gilt trim to handle and bands to edges (faded), stamped with makers mark Gibson & Sons Ltd of Stoke on Trent underneath. Height approx. 112mm. Sold for £187 at Bonhams, Chester, February 2002. Reg Hoye was a well respected artist having considerable experience and had illustrated some of Enid Blyton’s childrens books. Willie was one of four designs created, one was a boy and three were based on Lions. The design finally selected was of course Willie, with his looked based on Reg Hoye’s son Leo. 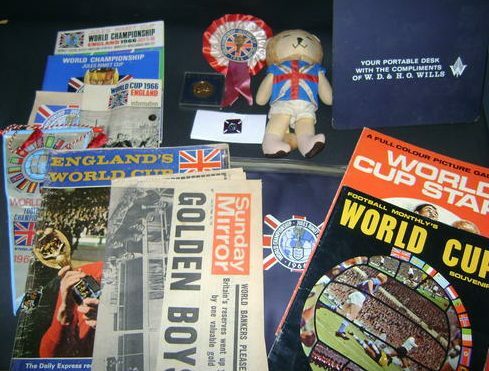 Pictured right: A collection of 1966 World Cup Football memorabilia – Including an original programme from 1966 World Cup final [g], Officials Union Jack design pin badge, World Cup Willie mascot toy, pennant, Football Monthly souvenir, W.D and H.O.Wills portable desk and folder, newspapers and magazines. Sold for £216 at Bonhams, Chester, October 2009. Willie was a massive success and was popular not only in the UK, but throughout the world. There was special interest in the character in Germany and Russia. Willie found himself on everything from mugs to bedspreasd, money boxes to posters and from tankards to plates. There was a huge merchandise boom based on Willie and the 1966 World Cup. Pictured left: 1966 World Cup Willie postcard hand signed by Bobby Moore A colour postcard of 1966 World Cup mascot Willie, postmarked 18 August 1966, with England Winners stamp, hand signed by Bobby Moore. Sold for £350 at Bonhams, Chester, October 2011. Another first for 1966 was the World Cup song which was aptly name ‘World Cup Willie’ and was sung by the skiffle king Lonnie Donegan. The song was re-released for the 2010 World Cup by Lonnie Donegan Jnr. 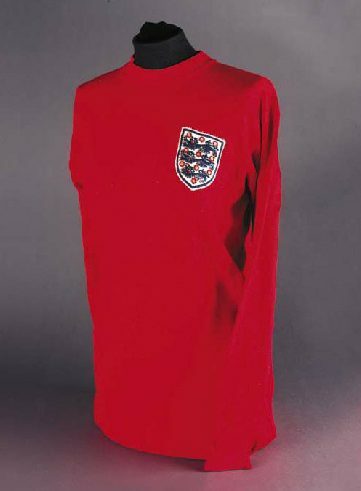 Pictured right: A red England 1966 World Cup final International shirt, No.10, with crew-neck collar and embroidered cloth badge. The shirt was worn by Geoff Hurst in the 1966 World Cup final against West Germany. England who started the 1966 competition as one of the favourites, due to the fact that the tournament was held on home soil, began their group qualifying games with a 0-0 draw against Uruguay. In the two remaining group qualifying matches England defeated Mexico and France 2-0 in both games. In the quarter-final match against Argentina, Geoff Hurst scored the only goal of an explosive match thirteen minutes from the end. England’s opponents in the semi-final were Portugal who had the wonderfully gifted Eusebio in their side. In a very entertaining match, England were worthy 2-1 winners with both goals being scored by Bobby Charlton. 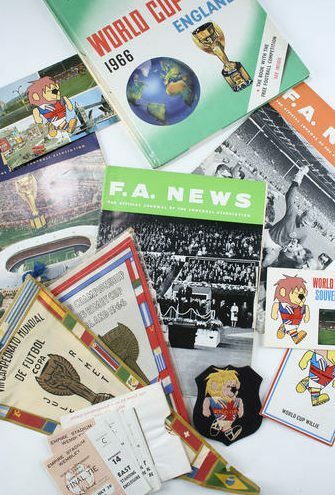 Pictured left: World Cup 1966 memorabilia – Eight tickets for games played in London to include Final and all England matches; two pennants; a World Cup Willie blazer badge; three F.A. News covering the World Cup; three postcards and official book by Purnell. Sold for £384 at Bonhams, London, June 2006. 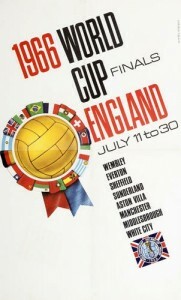 In the other semi-final, West Germany disposed of the U.S.S.R. national team by the same score and this set up a final match of the tournament between two of football’s oldest rivals at Wembley on 30th July 1966. 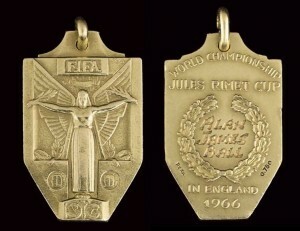 Pictured right: A 1966 World Cup Winner’s Medal belonging to Alan Ball – a gold (unhallmarked) World Cup Winner’s medal, 1966, awarded to Alan Ball, the obverse inscribed F.I.F.A., the reverse inscribed World Championship, Jules Rimet Cup, in England 1966, Alan James Ball, with ring suspension. Sold for £164, 800 at Christies, London, May 2005. Before a crowd of just under 100,000, Haller scored for West Germany in the thirteenth minute, but six minutes later Geoff Hurst scored his country’s equaliser. For the best part of the next hour, neither side dominated the match but with twelve minutes remaining Geoff Hurst had an optimistic shot at goal which spun in the air for Martin Peters to knock home for what appeared to be the decisive winning goal. However, with seconds remaining, a hotly disputed free-kick from West Germany found its way across England goal and Weber knocked the ball into the net for a dramatic equaliser which took the match into extra-time. 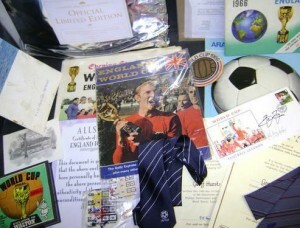 Pictured left: A collection of 1966 World Cup memorabilia – A large collection of memorabilia produced for the 1966 World Cup including stamps, World Cup Willie cloth badge, Geoff Hurst/Martin Peters hand signed picture, 8mm film of final, German album, football signed by Nobby Stiles, Gordon Banks, Ray Wilson, Alan Ball, Jack Charlton, George Cohen, Geoff Hurst, Martin Peters and Roger Hunt, Wembley seat back and a ‘Sooper Snooper’ World Cup periscope. Sold for £216 at Bonhams, Chester, Feb 2009. After ten minutes of extra-time, England scored their third and without doubt the most controversial goal that has featured in any football match, never mind a World Cup final. Alan Ball chased a long ball towards the corner flag and pulled it back for Geoff Hurst, who shot from the edge of the six-yard box with the ball crashing against the underside of the bar. The ball bounced down and then upwards and out of the goal area. Roger Hunt could possibly have knocked the ball into the net, but he turned away raising his hands in jubilation, convinced that the ball had crossed the line. The ball was then cleared for a corner without a ‘goal’ being given and the Swiss referee Gottfried Dienst ran over to consult the Soviet linesman, Tofik Bakhramov who awarded the goal. Pictured left and right: 1966 Carvosso World Cup posters – 2 original 1966 World Cup posters produced by Carvosso, printed by McCorquodale & Co. ltd, a rare one with dates and detailing the venues and the other with World Cup Willie mascot and dates. Sold for £432 at Bonhams, Chester, 2011. This goal is still argued about today and film evidence of the match is totally inconclusive. However, in the last minute, the match was finally settled when England’s captain Bobby Moore, found Geoff Hurst in the centre circle with a long pass. Hurst then set off on one of his long runs and with the immortal words of match commentator Kenneth Wolstenholme ‘and there are some people on the pitch. They think it’s all over…. it is now!” ringing in the nations ears, Hurst smashed the ball into the net for his side’s fourth goal and his hat-trick. 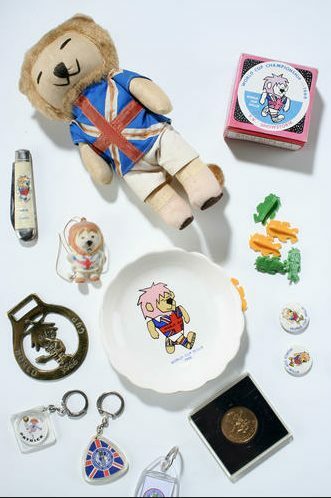 So 1966 was a year of many firsts, a World Cup win for England, the first World Cup mascot, the first World Cup song and start of merchandise boom around sporting events. Since 1966 there has been a mascot at each World Cup including Juanito for Mexico 1970, Tip and Tap for West Germany in 1974, Gauchito for Argentian in 1978, Naranjito for Spain 1982, Pique for Mexico 1986, Ciao for Italy 1990, Striker for USA 1994, Footix for France 1998, Ato,Kaz & Nik for South Korea/Japan in 2002, Goleo Vi for Germany 2006, and Zakumi for South Africa in 2010. World Cup Willie Price Guide / How much is World Cup Willie Memorabilia worth? With England winning the World Cup there was a lot of merchandise made and a lot purchased, so the majority of items are not extremely rare. The article features a selection of items sold at auction. 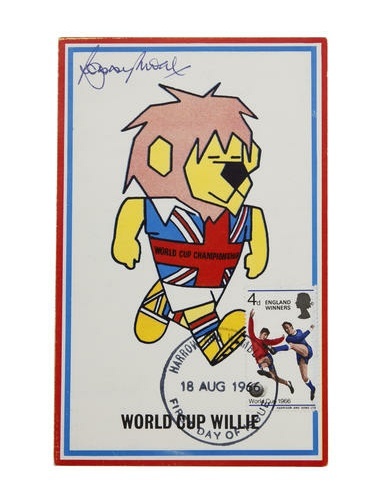 Ebay often has many World Cup Willie items but be careful as not all are vintage 1966.